After almost twenty-four hours of voting and counting of ballots, Mr Akinwunmi Ambode, former Accountant General of Lagos, emerged winner of the All Progressives Congress, APC, governorship primaries in Lagos by a landslide on Friday morning. The governorship primary was held at Onikan Stadium, Lagos Island, southwest Nigeria. Ambode polled 3,735 votes out of the total valid votes of 5,725 cast to defeat 11 other aspirants. The results were announced by Dr. Peter Obada, a representative of the APC National Primaries Committee around 8.13 am on Friday after counting was done all through the night. Following Ambode in second position is the Lagos State Commissioner for Works and Infrastructure, Dr. Kadri Hamzat, who polled 1,201 votes. Senator Ganiu Olanrewaju Solomon, GOS, came third after scoring 272 votes while the Speaker of the Lagos State House of Assembly, Adeyemi Ikuforji came fourth with 182 votes. Former Attorney General and Commissioner for Justice, Supo Sasore came 5th after polling 121 votes, while the former Commissioner for Health in Lagos State, Dr. Leke Pitan was 6th with 112 votes. Others are former Commissioner for Special Duties, Dr. Tola Kasali, 69 votes; Tayo Ayinde, former Chief Detail to former Governor of Lagos, Bola Tinubu, 17 votes; Adekunle Idris, nine votes and Tokunbo Wahab, seven votes. Mrs Tokunbo Tobun-Agbesanwa, Abayomi Sutton and Lanre Ope got no votes. Announcing the results, Obada said he was highly impressed by the people of Lagos and what the leadership of the party put in place to ensure a smooth primary election in the most transparent manner. “We tried as much as possible to be fair to all,” he said, while commending the aspirants for their maturity, saying that in every contest, there must always be a winner. He said if any aspirant was not satisfied with the result, such person should go to the committee set up by the party. Obada disclosed that 5,959 voters were accredited while 5,815 voted, with a valid vote of 5,724 and an invalid vote of 91. Obada said since Ambode scored 3,735 votes “he is hereby declared winner,” to the joy of his supporters at the event. There were jubilation all around Onikan Stadium as the popular song, “stand up for the champion,” rent the air, with party supporters brandishing APC’s symbol, the broom. 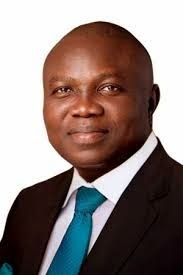 Speaking after the victory, Ambode said the accepted the victory with deep sense of gratitude, while commending the contestants for putting up a good contest. Ambode extended his hand of fellowship to other aspirants, not only to win next year’s election, but to move Lagos forward to grester heights.